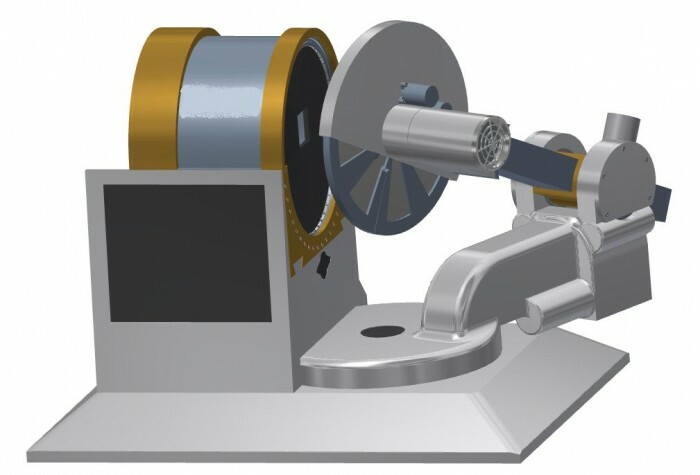 The purpose of the computer controlled numerical drop saw (cutter) is to accurately make two or more cuts in an elongate member, such as for making frames, especially complex frames with multiples members meeting at irregular angles, for example, joins for roofing timbers and other construction members. Also, for making one or more cuts at opposite ends very accurately, especially for a workpiece that has a round cross-section, although suitable for use with other cross-section workpieces, including irregular shapes. The drop saw (10, 200) is capable of cutting multiple intersecting faces in an elongate workpiece (34) at precisely controlled angles or two faces at precise offsets in an elongate workpiece (34) that can be pivoted about its longitudinal axis. The drop saw (10, 200) being able to accurately make two or more intersecting or spaced apart cuts in the workpiece by adjusting the orientation of a workpiece holding means (28, 30, 32, 228 and 230) with respect to a cutting means (22, 24, 26, 222, 224 and 226) in an x direction and at least two other directions chosen from a set including: y, z, [alpha], [beta] and [gamma], where the x, y and z directions are orthogonal Euclidean directions and the [alpha], [beta] and [gamma] directions are polar angular directions. The workpiece (34) being pivotable about a longitudinal axis that is contained within its cross sectional area, rather than being pivotable about a longitudinal axis disposed upon the outer surface or outside of the workpiece (34). This cutter is ideally suited to a market where timber is the predominant mode of housing construction. The cutter can be used by non-skilled workers to produce precise complex joins in two or more timber members in a building roof or wall. The cutter takes the techniques of numerically controlled lathes (CNC lathes) and applies them to the lowly drop saw to make a precision drop saw that is both safe and useable by unskilled workers. For professionals and consumers who require a safe and easy to use “no marking”, high precision, rapid cutting tool that does more in less time by using advanced technology. The multifunction mitre saw provides the user with simple procedures to make multiple cuts to wood, metal or any other type of material. The 90 year old mitre fence has finally been replaced. A prototype was developed using lathes and a CNC mill to test the concept and to solve a particular need that no other product on the market could resolve; specifically to make precision dihedral cuts in round bar. An Autodesk Inventor model has also been designed and is ready for stage-two prototype development using a 14”/355mm blade. The two main benefits are the saving of time with resulting high precision cuts. There is no need to mark the workpiece anymore and each cut is final. There is no need to clamp the workpiece multiple times or adjust the mitre or bevel angles every time a cut is made. Common joints can also be cut with the same device. It will also create new markets as it allows new types of high precision joints to be made. It also has another great benefit in that it is not disruptive to existing saw technology. Also, the user does not need to touch the saw as the cuts are made. This “hands-off” approach to cutting make this the safest portable saw in the market. Currently, there is no direct competition that makes multiple precision cuts in an elongate workpiece with a portable device, especially when cutting round bar. The closest competition is a compound mitre saw where you have to manually adjust the workpiece or head for each cut and this is a time consuming process that introduces inaccuracy. 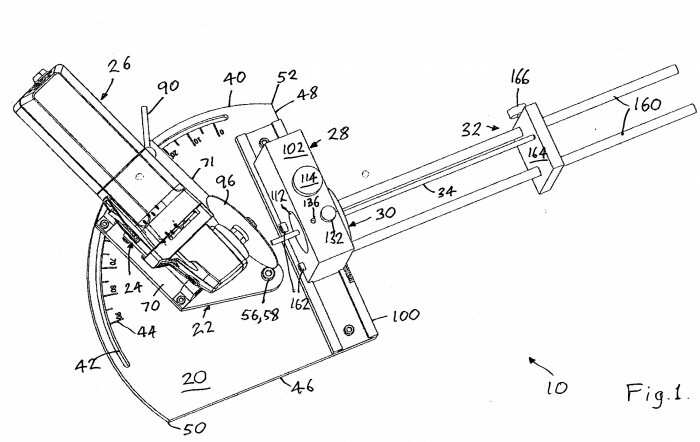 It should be noted that the compound mitre saw also only includes a subset of the features of this invention. The main advantages of this mitre saw over the competition are massive productivity gains, precision multihedral cuts and multifunction capabilities in a portable device. It does this by employing a clamping device that holds the workpiece 100% of the time and dispenses with the 90 year old fence. It also dispenses with the clumsy, restricted concept of a tilting cutting head but maintains the ability to cut bevel and compound angles. The typical customer will be someone who wants to automate the cutting of wood, metal or plastic as much as possible. They may want to make joints in the same material and only want to clamp the workpiece once. They don’t want to swivel or rotate the cutting head but do want to make precision cuts. Last but not least; they want to do it quickly. New customers for new markets will also sprout, including geodesic home builders, R & D Departments and Remote Control enthusiasts, to name a few. Both professional users and consumers would benefit from this advanced technology. Gazebo builders, steel fabricators, manufacturers, roof framing carpenters and Remote Control (RC) builders have all shown interest in the product to date, with order requests as well. The world electric saw market is forecast to rise 5.0 percent annually to 3.3 billion units in 2016, with the professional market outgrowing the consumer market (Freedonia study #2996, Feb 2013). As a result, the professional market would be the primary target market, with key industries being construction and manufacturing for use in metalworking and woodworking. Although these would be the primary markets, the marketing opportunities are endless as this device opens up new and far more efficient ways to cut and shape elongate material. 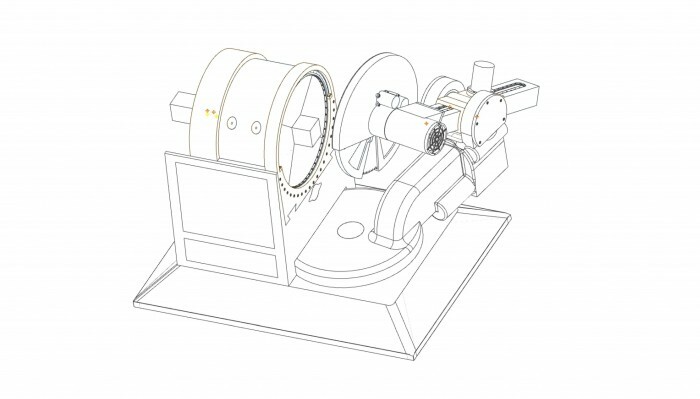 This product is a numerical drop saw and as such defines a whole NEW MARKET between low cost, low precision drop saws and high cost, high precision numerical lathes (so-called CNC lathes). This market is presently NOT supported by manufacturers of drop saws since it is requires technology they lack and CNC manufacturers are NOT in this market because they already control a large and mature market for lathes. So our numerical drop saw is a PRIME PRODUCT for a company seeking to dominate a new market in the building and construction industry. Based on a 14”/355mm mitre saw, the approximate cost to manufacture is $800. Using a gross profit margin of 33%, it is expected the wholesale price will be around $1200. The cost to manufacture is of course manufacturer specific as supply and manufacturing technologies and efficiencies will heavily dictate the final item cost. The gross profit would also likely be higher due to its multifunction capabilities. The developer of the multifunction mitre saw had a need to make a precision dihedral cut in round bar and there was no such device available on the market. He then decided to invent something to achieve the job and then built it using a lathe, a standard milling machine and a CNC mill. 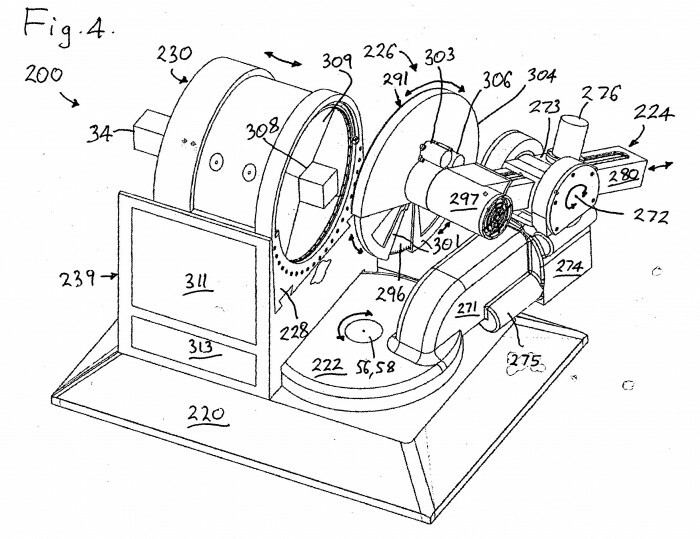 The inventor has been inventing things since his childhood; an “automatic golf ball washer” being his first invention when he was twelve years old and then building a fully functional racquet stringing machine when he was fifteen years old. Since then, he has been making devices from wood, metal and plastic using lathes, milling machines, mitre saws, circular saws, drop saws and 3D printers, to name a few. This numerical drop saw presently has intellectual property rights that require significant investment in the next month. Hence, the asking price (see below) is sized to reflect this need for IMMEDIATE ACTION. Acting now shall provide maximum monopoly on any markets developed for this drop saw. Waiting shall minimise monopoly rights and reduce and reduce possible returns on investment. 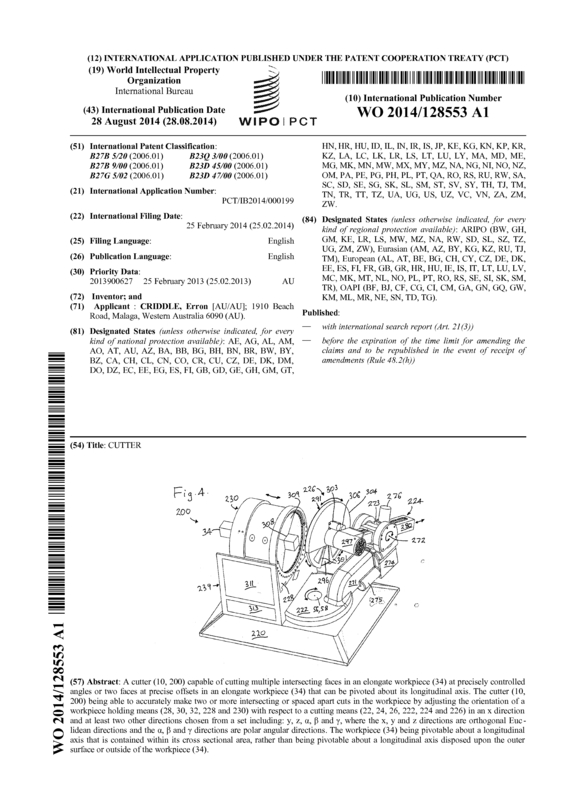 Page created at 2019-04-25 0:00:59, Patent Auction Time.